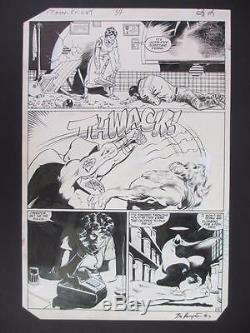 Moon Knight #34 MARVEL 1983 - Page 22. We offer LARGE pictures that once clicked, you can easily drag to your desktop for a closer look! A Beautiful page by Bo Hampton! The image area is 10.75" x 16". Check out all of our other. Listings for more treasured collectibles. Boxed and well cushioned with bubble wrap/newspaper/packing peanuts. The item "Moon Knight #34 MARVEL 1983 (Original Art) Page 22 by Bo Hampton" is in sale since Wednesday, May 17, 2017. This item is in the category "Collectibles\Comics\Original Comic Art\Interior Pages". The seller is "collectors_comics" and is located in California. This item can be shipped worldwide.